When it comes to hair and extensions, having the right tool is of great importance. Otherwise, even the simplest tasks can become very hard and complicated, and nobody wants that. 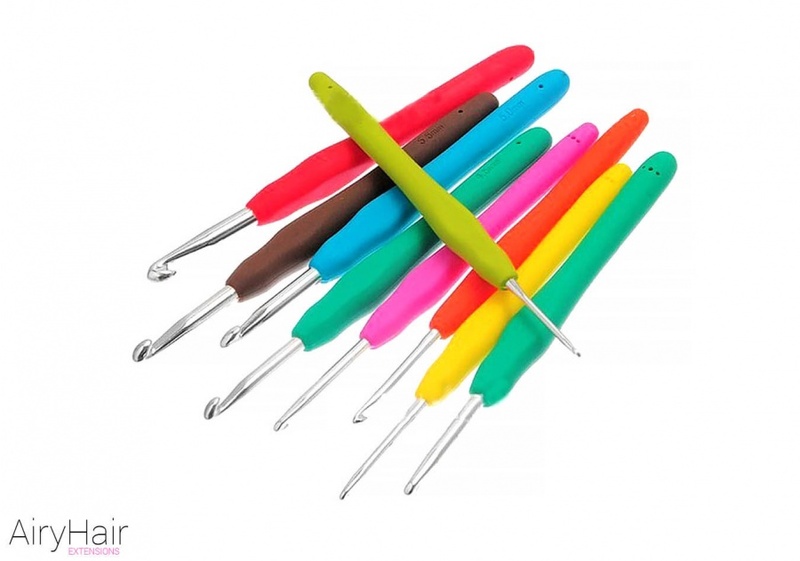 Our latch hook crochet needle is certainly one of those essential tools. It is widely used in hair salons as well as for personal, home use. Its main use is for threading micro and nano beads in order to install extensions, but this handy needle has a lot more interesting uses that we’ll explain and show you. Our colorful needles consist of a handle and a latch hook that is very easy to use. The handle comes in two materials, wood and plastic, with only a small price difference. We also offer you a longer variation of the wooden needle. With its easy to grip and comfortable handle, any task is super easy and quick to do. Even if you use it for longer periods of time, your hand will not hurt because the needles are light and fit the hand perfectly. The latch hook part of the needle is made out of quality metal material which ensures longevity and allows you to do many different tasks. Our needle pack also comes in different sizes of the latch hook so you have even more options of how to use them because sometimes you need small ones and other times the bigger one is more useful. How to Use a Crochet Needle? Latch hook crochet needles have a couple of different uses and that makes it a great tool to have around in your salon or at home. Let’s take a look at a couple of different ones. 1. You need to separate a very small, uniform strand of hair. 2. Place the micro or nano bead onto the needle. 3. Take the strand of hair with the latch hook and pull the bead through. 4. That’s it! It couldn’t be simpler! Ventilating is a process of making a wig by adding all the hairs by hand. With this process, you can create a whole wig from scratch, repair a wig, or you can add hairs to an existing wig to make it fuller and denser. Although you can sew in bundles of hair with a regular needle, for sewing one hair at a time, you need a latch hook needle. Once you get a hang of the process, it is quite simple, although it does take a lot of time. But it’s definitely worth it because the results are amazing and you get perfect lace wigs. For the wig ventilating process you need a mesh cap, synthetic or real human hair, and a latch hook needle, if you’re making a wig from scratch. Otherwise, take a wig you want to repair or add some additional hair to and grab your needle. Before you begin this process, keep in mind that it will probably take a lot of time, depending on how many hairs you’re putting in. Let’s start! 1. Take your empty mesh cap or wig and find the place you want to begin. 2. You will notice that the mesh material has small holes and that’s where the hairs go in order to create a full head of hair. 3. Take your latch hook needle and pull it through one hole on the mesh material. 4. While the needle is through the hole, take a couple of individual hairs with the latch hook. Pull it through the hole. Go around and pull the hairs with the latch hook again. 5. With a sharp motion, pull your needle and the hairs will create a knot on the mesh. 6. Now that the first hairs are in, repeat the same process as needed. 7. If making a wig from scratch seems like too much for you, you can always buy a full lace or a lace front wig. Then you can use the needle so simply reapply some of the hairs that may have fallen out which is a quick task. How to Make a Crochet Braid? Crochet braids look incredibly cool, but did you know that they actually use extensions? That’s right, you can add fake hair to your real one by making crochet braids. And the essential tool for creating these braids is of course the latch hook crochet needle. The process is quite simple once you get a hang of it and our special needles will make it a breeze. Here are the simple instructions on how to make crochet braids and get that cool look. 1. To being, you need to make regular cornrows on the top of the head. 2. Take a latch hook needle and pull it under the cornrow braid. 3. Take a small strand of extensions, fold it in half, and hook the middle part onto the latch hook. 4. Pull the strand through by removing the needle from underneath the cornrow. 5. You will notice that you have a loop that is created from the strand. Hold it with your fingers and pull the needle out. 6. Push the strand through the loophole twice and pull on it to create a tight knot. 7. Repeat this process as needed and that’s it!